This is the UNISON (East Midlands) blog for the region's "Local Government Matters" campaign to protect local government services and jobs. Some cheeky scamps have set up a website called MyDavidCameron.Com where they have modified the recent Conservative Party billboard posters featuring David Cameron attempting to reassure voters about his intentions. They've done several parodies around the NHS and the Conservative plans to cut inheritance tax for the rich. If you click here you can see them. The site also gives links to other websites that give a detailed analysis of the Conservative's position on public services. The site also allows people to download the poster and do their own versions of the poster. Here in the Local Government Matters bunker we just could not resist the opportunity to do our own version of the poster. 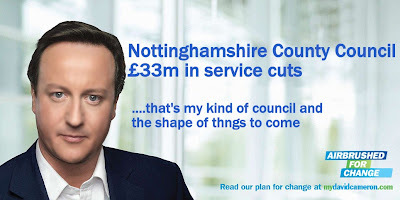 Readers of the blog will know about the £33m of cuts proposed at Notts County Council, despite UNISON proving conclusively there is at least £24m of "easy money" to be found, possibly more. Whilst it is certainly amusing to parody the Cameron posters, no-one should lose sight of the very serious message about the intentions of Conservative councils and a future Conservative government. My david cameron have said they wont be satirising the next tory poster, knowing its had its day. Still, this hasnt the tories from making their own p-poor fake poster sites. What will be next? The posters have already been turned into a 3d game (http://www.politicalgaming.com) and other copy sites are springing up. This is the UNISON (East Midlands) blog for the region's "Local Government Matters" campaign to protect local government services and jobs. To find out more, read on. If you are not a UNISON member and want to join the country’s biggest union for local government workers then complete the application form using the link in the sidebar. Or you can call 0845 355 0845. If you are UNISON member and you want get involved in your union call your local branch. If you don’t know which branch you are a member of, or how to contact them, call 0845 355 0845 for help.